With a long fashioned enjoyment for a martini, I’m often led toward a tendency to experiment with martini garnishes in combination with gins. The savory martini was born on a summer night at The Larchmont in Hollywood. One of my favorite guests, Vince, came to the bar asking one of my favorite questions “What new in the gin world have you got for me today?” Three martinis later as i was walking to the refrigerator, having thrown all my favorite martini tricks at Vince over the past few weeks I began to feel the conjuring of something new, “Savory” repeated in my head. Prior to leaving his table he had given answer to my question, one that i prefer asking most when a guest is at a loss for a decision on their next appropriate alcoholic beverage. “What adjectives describe your craving?” Its a question that sparks creativity. “Savory” was the answer and was it ever! 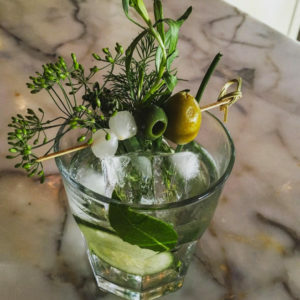 The Savory martini has since become the house mascot of The Larchmont in Los Angeles.